en.wikipedia.orgGeorge Orwell during his Burma years. When George Orwell wrote his essay, ‘England your England,‘ there were Nazi bombers flying overhead. And with the threat of death all around him and global trust at an all-time low, he wrote one of the most insightful meditations on a human character — specifically his own country’s — of modern time. Orwell would recognise where we are now. We have come to another historic low in global trust. A union that was resolved in order to bring warring nations so close together they would never try to kill each other again is being beaten away, and in choosing “Brexit” — in choosing to leave the European Union — it was the English who threw the first truly damaging blow. But why? Markets are crashing all over the world. There is red on every trading screen from Hong Kong to New York, Tel Aviv to Sao Paulo. We knew this would happen, as the market has convulsed on the very thought of Brexit for weeks now. In a world where liquidity is scarce, where the most brilliant financial minds in the world have stopped hearing the music of the market, why? 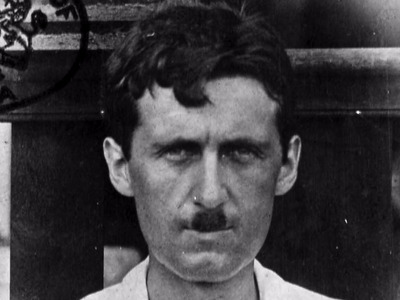 The very working class that Orwell wrote of is the class that voted for Brexit. And they voted for it after being fed a diet of outright lies about how much it costs to be in the European Union and who would or could join it (and subsequently the English) through membership or through its open borders. The arguments the leave side made about sovereignty also jibes with the insularity Orwell describes. Yes, it was the UK that voted for leave, but it was really England that decided the vote. Scotland and Northern Ireland voted to remain, while Wales was pro-Leave, but to a lesser extent than England. The xenophobic rhetoric of this campaign has been nothing short of stunning. When Nigel Farage, the public face of the leave camp, said “this will be a victory for ordinary people, for decent people” he meant Anglo-Saxons. He does not trust anyone else. And he will pay for that. 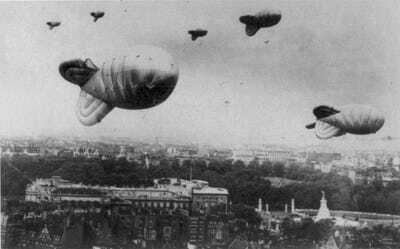 Wikimedia CommonsBarrage balloons over London during WWII. I’ve said this a thousand times, but I’ll repeat it again. The word “credit,” the thing that makes our global economy go, comes from the Latin word for trust. If we no longer trust each other, if we move away from each other rather than towards each other, the world cannot be rich. There are too many people on this planet and too few resources. We want too many things and that are placed in other countries and produced by other people. This is why markets are convulsing. They are convulsing because companies like Ford get almost 20% of their revenue selling cars in the UK. They are convulsing because the richest man in Hong Kong will now pull investments from the UK, and likely give his idea to build a telecom company there a second, hard thought. Economists, political leaders, and George Soros, the legendary investor who broke the Bank of England, told them not to do it, but the English did it anyway. That is why markets are convulsing today and they will continue to do so for fear that this desire to decouple from the globalized world we’ve built is as just strong among other people as it was among the English. And what if they leave? Analysts at HSBC explained that through bond yields, the money we pay to lend credit to each other — the level at which we think we can afford to trust each other. 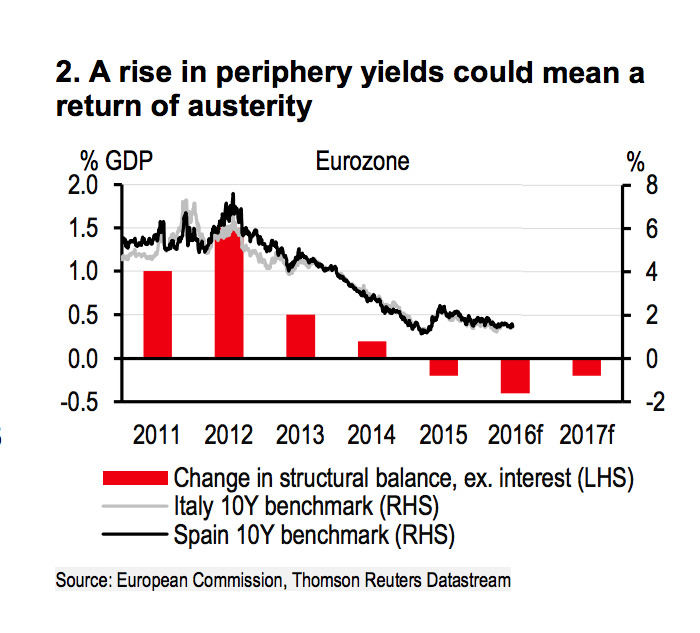 The impact on GDP will be orders of magnitude greater if there is political contagion that causes bond yields to rise, particularly in the periphery. The widening of spreads during the week commencing Monday 13 June when opinion polls in the UK swung towards a vote to leave suggests that some market contagion is likely. 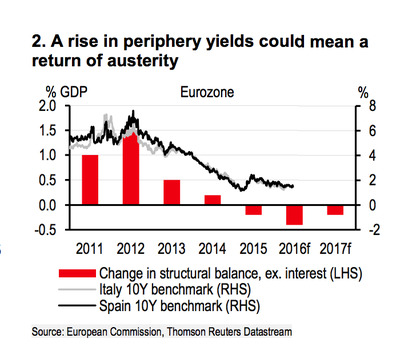 In Europe, countries eeking out a recovery from the last economic crisis will have to turn back to austerity (more from HSBC). A significant contribution to growth this year and next is expected to come from fiscal stimulus either directly via government spending or indirectly via tax cuts and subsidies. Given primary deficits (stripping out interest payments) have deteriorated so far this year, if bond yields rise, deficits will quickly expand, putting pressure on debt-to-GDP ratios, and fiscal tightening could quickly become the focus once again. In Emerging Markets, the analysts say, the recovery in commodity prices and weakening of the US dollar that averted more severe economic malaise in countries like Brazil and China will turn back. This is part of what wreaked so much havoc on global markets earlier this year. Janet Yellen may not see a reason to raise interest rates here in the United States until this is resolved, and no one knows when that will be. But this is what the English wanted. This is economic sovereignty in 2016. It is cutting off your nose to spite your face. It is sewing the seeds of mistrust. It is drying up credit in a world already desperate for growth. The English will all have to live with that — with each other — alone.